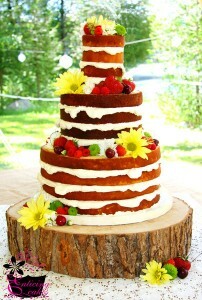 This multi-tiered cake features gorgeous white icing between each layer, set off by brightly hued flowers and berries. The use of deep red berries, raspberries, and cherries is perfect for a summertime cake. The yellow and green flowers give a great pop of color. There’s no need for a cake topper with cake – flowers and fresh berries do the job! You can find this wedding cake here. It was created by Enticing Cakes Inc.